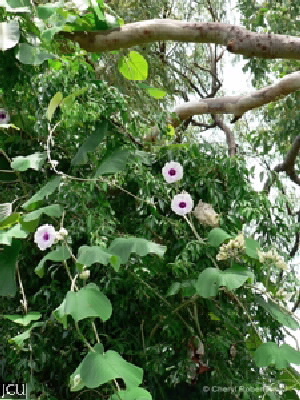 This vigorous vine has large, leathery heart-shaped leaves, which are white on the underside due to hairs. The clusters of mauve flowers are followed by hard, woody capsules, which when they ripen break open to resemble miniature roses. This weed is related to the wood rose. 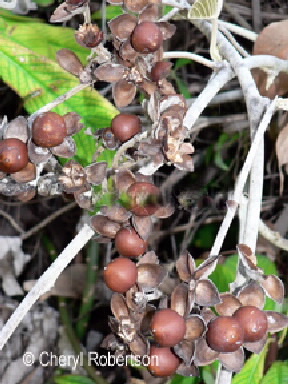 The toxic seeds should not be eaten as they contain alkaloids. It is growing along with the native jasmine just left of the walkway from DA2 to DA5.